Why Do These Trippy Reindeer Eyes Change Color With The Seasons? Dogs and cats are adorable creatures by day, but under the cover of night their eyes seem to shine like demon spawn. That's the work of the light-reflecting tapetum lucidum, a layer of tissue that sits right behind the retina. 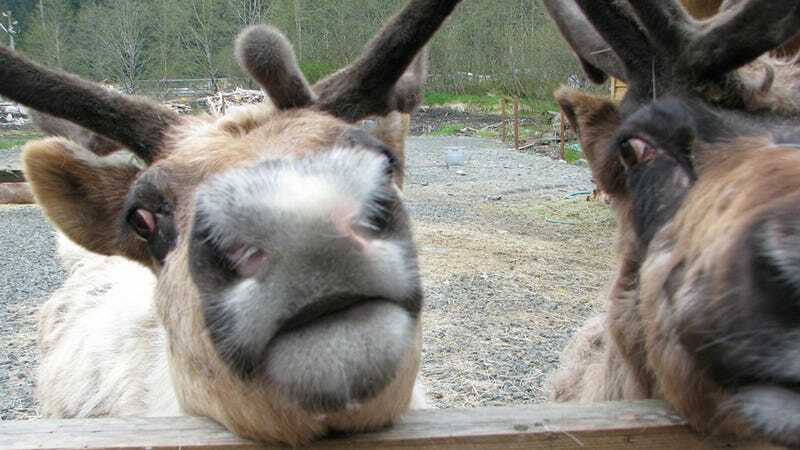 As it turns out, that same tapetum lucidum just might be responsible for turning reindeer eyes from gold-hued in the summer to blue-tinted in the winter. Neat! Popular Science points us to a study published in the Proceedings of the Royal Society B journal, which outlines the biological response the arctic animal goes through during the extreme change of seasons in the harsh environment up north. TL in (a) winter and (b) summer eyes following removal of the cornea, lens and vitreous.